Your bone strength and size peaks by age 30. After that, bones tend to become less dense, making them more fragile and subject to breaks. Bone strength in later life depends upon your peak bone mass in youth. An active lifestyle in youth can increase maximum bone density. Even if you're older, exercise is still a great way to protect your bones. The physical stress placed on bones during exercise stimulates the growth of new bone tissue. The type of exercise you do matters. 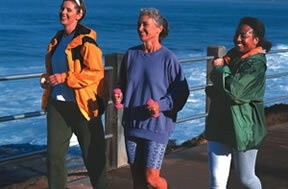 To bolster your bones, you need to get regular weight-bearing exercise. This includes weight lifting and resistance training, as well as any type of activity that forces you to work against gravity by standing or carrying your body's weight, including running, walking, dancing, and stair climbing. Activities such as swimming or biking aren't weight-bearing and thus don't build bone. Generally, higher-impact activities (such as running) or resistance exercises (such as strength training) have a more pronounced effect on bone than lower-impact exercises, such as walking. Only the bones that bear the load of the exercise will benefit. For example, running protects bones in the hips and legs, but not the arms. A well-rounded strength training plan can benefit practically all of your bones. Because exercise improves your overall strength, coordination, and balance, it also makes you less likely to fall, which means less opportunity to break a bone. To read more about the many benefits of exercise and learn how to start an exercise program that works for you, buy Starting to Exercise, a Special Health Report from Harvard Medical School.